Every birder is familiar with migration as a great time to see new and unusual bird species passing through areas where they might not be found during the breeding or wintering seasons. Learn how long it takes for a bird to migrate south, and so much more. These bird migration facts might surprise you! The word migration comes from the Latin migratus that means “to change” and refers to how birds change their geographic locations seasonally. There are many different types of bird migration, but all involve some sort of geographic change in a bird species' range. Migration peaks in spring and fall, but in reality, there are birds migrating 365 days a year. The actual dates of when birds migrate depend on many factors, including bird species, overall migration distance, travel speed, route, climate, weather patterns, and more. Before migrating, many birds enter a state of hyperphagia, where hormone levels compel them to drastically increase their body weight to store fat to use as energy while traveling. Some bird species may as much as double their body weight in the weeks leading up to migration. This time period is when extra food sources, such as backyard feeders, are especially critical to help birds build up this reserve fuel. The time it takes a single bird to complete its one-way migration can range from a few days or weeks to up to four months, depending on the total distance, flight speed, route, and stopovers. Birds migrating late in the season typically travel faster than earlier migrants of the same species, even along the same general routes. Hawks, swifts, swallows, and waterfowl migrate primarily during the day, while many songbirds migrate at night, in part to avoid the attention of migrating predators such as raptors. The cooler, calmer air at night also makes migration more efficient for many species. Birds that migrate during the day most often take advantage of solar-heated thermal currents for easy soaring so they can fly further using less energy. Migrating birds use the stars for navigation, as well as the sun, wind patterns, and landforms, all of which help guide them to the same locations each year. The earth's magnetic field also plays a part in how birds navigate during migration. Birds may fly from 15 to 600 miles or more per day during migration, depending on when they are migrating, how far they have to go, and the conditions they face along the route. Suitable stopovers and abundant food, water, and shelter also affect how far birds may travel in a single day. Transoceanic migrants, birds who follow a migration route that crosses an ocean, may spend up to 100 hours or more in the air at a single time until they come to land. In extreme conditions, these birds have been known to land on ships at sea when they are desperate for rest. When they reach land, there are often fallouts of exhausted migrants that all congregate at the first available shelter or food source. Many birding festivals take place at these fallout hotspots during peak migration periods. Many migratory birds have longer, more pointed wings than nonmigratory species or birds with shorter migrations. This wing structure is more aerodynamic with less air resistance and allows for a more efficient, easier flight, particularly on long journeys. Migrating birds travel at speeds ranging from 15 to 50 miles per hour depending on the species, flight pattern, air temperature, and prevailing winds that can increase or decrease speed. While most migrating birds fly at heights lower than 2,000 feet, birds have been recorded migrating at up to 30,000 feet high, a record held by the bar-headed goose. The height of a bird's migration flight depends on wind patterns and landforms that may create obstacles, such as mountain ranges. In the case of the bar-headed goose, these birds migrate across the Himalayan Mountains. The ruby-throated hummingbird migrates from the Yucatan peninsula of Mexico to the southeastern United States every spring. This journey of 500 to 600 miles over the Caribbean Sea takes 24 hours without these tiny birds getting a break. The rufous hummingbird has the longest migration of any hummingbird species: a one-way trip of 3,000 miles between its breeding grounds in Alaska and its winter range in Mexico. In spring, rufous hummingbirds travel north up the Pacific coast, while in autumn they travel south through more mountainous regions. This allows them to take advantage of flowering plants for quick energy in both directions. In spring, coastal flowers bloom earlier, while in autumn, mountain flowers are blooming later. 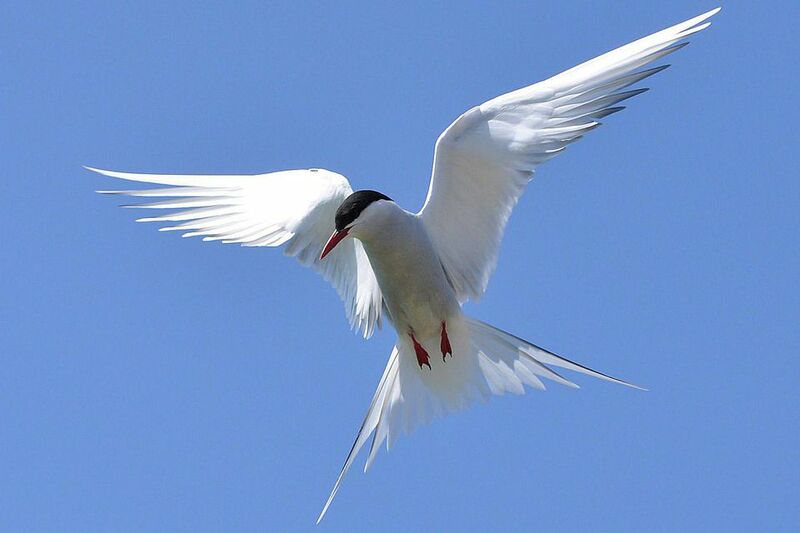 The Arctic tern has the longest recorded migration of any bird on the planet. Banded Arctic terns have confirmed a round-trip migration of roughly 22,000 miles, a feat that astonishes ornithologists and birders alike. Migrating birds face many threats along their journeys, including window collisions, confusing lights that disrupt navigation, hunting, habitat loss, and predation. Juvenile birds are at greater risk because of their inexperience with migration, yet somehow, billions of birds successfully migrate every year! What Are the 12 Ways Birds Migrate?